The Greek Goddess... of hygiene? | Smile Logic, Inc.
Our practice is called Dental Hygiene. Ever wonder the Why, What and Where of the word “Hygiene”? It’s a Greek word, and it’s a Who. 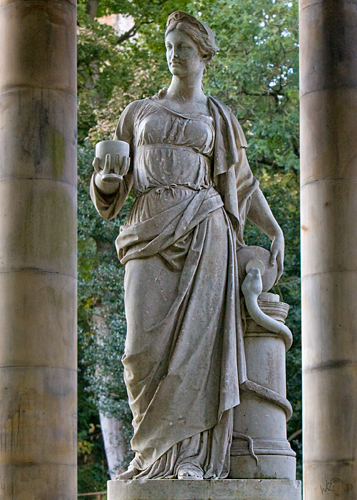 Hygieia ( Ὑγιεία) was the goddess of health, cleanliness and sanitation. She was the daughter of Asclepius, the father of medicine, and Epione, whose name means “soothing”, in this case of pain. She had sisters who helped with other parts of the physicians’ god Apollo’s work, including Panacea, the goddess of medicines. Hygiene’s work was prevention; health is promoted and illness prevented by cleanliness. This is a statue of Hygieia. She is feeding one of the snakes that wraps around the Caduceus, the medical symbol of the physicians staff. Two snakes curl around in the pattern of DNA, the basic material for heredity. The image is a message to care for your body, and in our case, to care for your teeth, as a source of health and prevention of disease. Who knew!